Every once and a while I will pass a billboard sign or see a bumper sticker that will just irk me a little bit. It is usually a pretentious saying word, “Co-Exist”, that is made up of all different religous symbols. I mean, on the one hand, I get that the bumper sticker is telling people to get along, hold hands, and skip along the yellow brick road with one another while practicing different religions. In essence, it is calling for acceptance of religious pluralism, the notion that all paths lead to God (a problematic notion to say the least). On the other hand, the problem in the world is that we ARE CO-EXISTING!!! We often don’t co-exist peacefully, but we are definitely co-existing. Co-existence does not equal peace. 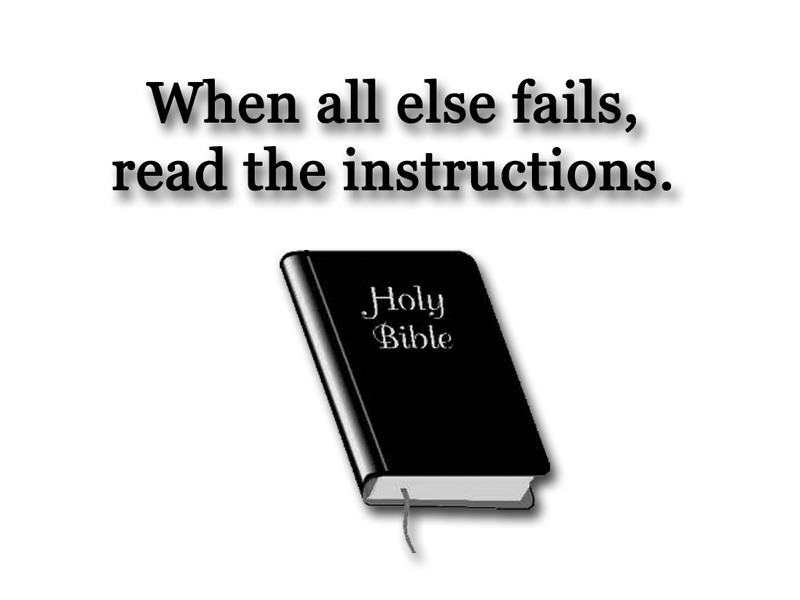 With that said, the other day I was driving down the road and I happened to see a billboard sign that read, “When all else fails, read the instructions.” Underneath those words was a large picture of the the Holy Bible. On the surface, those words seem to make sense. I am a Christian who actively reads the Bible and try to live by what I believe to be the core teachings within it. But the words on that billboard are overly simplistic, they imply that the Bible is a last resort, and they do not accurately depict what the Bible actually is. If the Bible is a divine manual given to us so that we can follow its “instructions”, which instructions should we follow first? Perhaps, we should stone our children when they’ve dishonored us (Deuteronomy 21:18-21). Perhaps we men should remain unmarried and make ourselves eunuchs for the sake of the Kingdom (Matthew 19:12). If we are going to follow the “instructions” then shouldn’t we get rid of our personal property and share it in common with the church (Acts 4:32-35) and shouldn’t women cover their heads (1 Corinthians 11:6) and remain submissively silent (1 Timothy 2:11-12)? The fact of the matter is that what we have in the Bible is much more than a set of “instructions” for us to follow. While there are laws, rules and regulations, the Bible is also a collection of writings that reflect each author’s understanding of the human-divine relationship, as well as their commentary on the socio-economic and political situations of where they lived. The Bible is very much a living testament to the faith journeys of the ancient people who wrote and compiled it. The Bible is also a foundational text that we relate to and from which we spiritually grow. While the Bible is certainly an important part of our Christian journey, and while I certainly encourage people to read and study it, I do believe that we Christians tend to get confused on what the Living Word of God really is. Is God’s Word a mere book, a mere set of rules and regulations on how to not upset the big daddy in the sky? Is the Word of God a book that has both a beginning and an end, a book that is finite and limited to words on a page? Is the Word of God bound in a book that can be used and misused? If we are going to have a traditional Christian theological understanding of what the Living Word of God is, we might want to take a hint from the first chapter of the Gospel of John. The Living Word of God is not a bound collection of ancient books written by people who were inspired by God; rather, the Living WORD of God is the risen Jesus Christ. That WORD cannot be bound nor contained. It knows no limits and it reaches different people in different ways. The WORD of God is not stagnant and typeset on flimsy paper, it is living and breathing through Christ who not only lives in us, but also through us. When all else fails, know that the Word of God, which is living within you, does not! Lord, I thank you for the Bible and for the inspired words within it. But my greatest praise is for your WORD, Christ Jesus. Amen. Very nicely put to words and exactly how I’ve been feeling. Thank you Cheryl! I am glad it resonated with you! God bless!